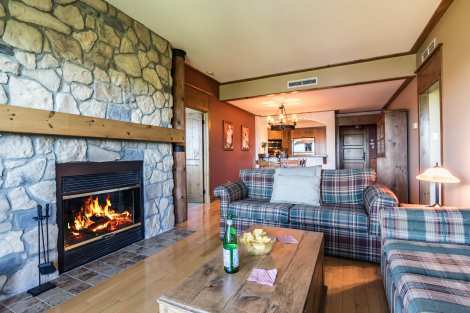 Beautiful country-style vacation home that can accommodate a family of five. The open-concept space lets guests stay in contact. The two bedrooms are located on either side of the main room. The master suite has a king-size bed and private bath, while the second bedroom has a queen-size bed. The focal point in the living room is the beautiful wood-burning fireplace. In the summer, eat or enjoy drinks on the spacious balcony while taking in the stunning sunset. Air conditioning and heated tiles ensure that guests will always be comfortable. Amenities also include wireless high-speed internet, three TVs and a DVD player. We provide superior personalized service, exclusive complimentary added values for the entire family, 24/7 front desk, concierge service, starter kit, free cleaning service after check-out, free parking. We have an impressive collection of well-appointed and cozy condos and vacation homes, including some pet friendly units. We are confident to meet the expectations of our all our distinguished guests. The best way to vacation with peace of mind and create memories you will cherish forever is to stay with Rendez-Vous Mont-Tremblant. Each property has one free reserved parking space.